Hello. I’ve been a big fan of cryptozoology and all kinds of other strange phenomenon since I was a kid growing up in the 1970s. While I loved most anything that would have been seen in those days on the show “In Search of…” the subject that has always fascinated me the most is Bigfoot/Sasquatch. In the days before the internet books were one of the few ways for a kid t try to get information on stuff like that and Loren Coleman’s books were/are always an important part of my literary collection. It’s great to see the Cryptomundo site and I’ve been following it for a long time now. 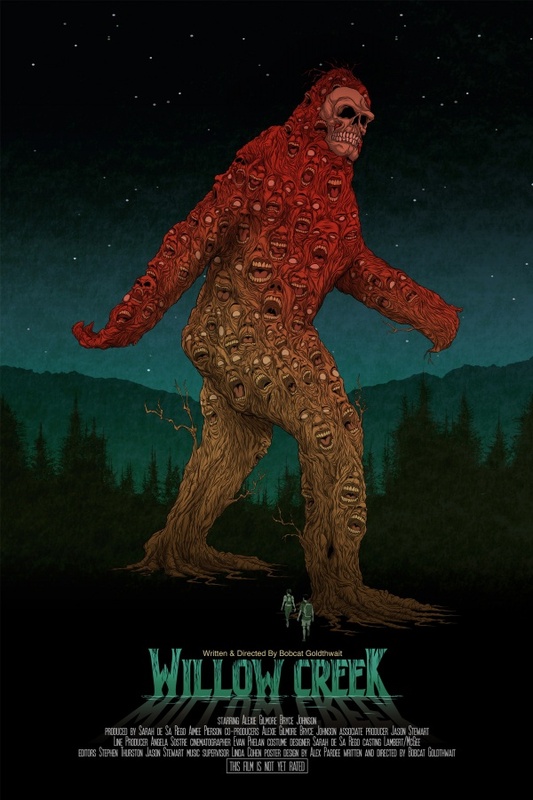 I also wanted to let you know that I saw the world premiere of Bobcat Goldthwait’s new Bigfoot movie “Willow Creek” on Monday. As there doesn’t seem to be a lot of press about it I thought you might be interested to hear from a long-time BHM enthusiast that I thought the movie was very good. There have been a slew of terrible, schlocky horror movies with Bigfoot attached as the “killer” over the past decade or so. While I don’t know what others would feel about Bobcat’s movie, I am very happy to report that it’s not like all those other movies at all. It feels a lot more like something from the 70s (like “Sasquatch:The Legend of Bigfoot” or “Creature from Black Lake”). If you’re interested in hearing more about the movie and the premiere, I wrote a blog entry/review about it. “Willow Creek” tells the story–through found film footage–of Jim and Kelly, a couple who are trying to make a documentary about Bigfoot by traveling to the Pacific Northwest, visiting some of the tourist traps of Bigfoot Country and camping out at the site of the most famous Bigfoot sighting of all-time, Bluff Creek. This was where, in 1967, Roger Patterson and Bob Gimlin took the famous footage of a large bipedal creature walking off into the woods that yielded the most well-known image of Bigfoot ever taken–an iconic image familiar with both Bigfoot enthusiasts and people who don’t even know anything about the subject. The trip starts out with the couple driving toward their destination. We get to know them through their personal moments “unwittingly” caught on film as they record the first somewhat awkward scenes of their film. Jim is a believer in the subject and very excited to be making the pilgrimage to Bigfoot Country. His girlfriend Kelly doesn’t believe there is anything to the Bigfoot myth, but is happy to accompany Jim on the adventure and help him out with his film. The first thing I liked about the movie was that this section showed the couple visiting a number of actual Bigfoot tourism sites and a number of real Bigfoot “personalities” are featured. It’s a pretty fun look at an area that I’ve always wanted to visit myself, but probably never will. While this is definitely not a comedy, there are quite a few nice bits of humor in this “introductory” segment of the film. All the while the couple is preparing for the ultimate voyage to the Patterson-Gimlin film site. To set up some conflict there are local people who warn the couple that they shouldn’t take the trip. From telling them that it isn’t something to joke about, to warning them that it could be dangerous, to actually threatening them, people seem to think that the excursion isn’t a great idea. When they finally do take off for the film site we get an idea of just how remote the area is. Paved roads lead to dirt roads of increasingly poor quality. This is where they meet a creepy hillbilly who gives them a very clear and direct threat that they should turn back. Of course they don’t listen. They finally have to hike in the last few miles when the road eventually ends altogether. As it gets close to nightfall they decide to make camp before finishing the journey in the morning. This is where the main action of the film happens. They wander away from their tent to check out the scenery (and take a dip in a stream) and return to find the campsite trashed. Trashed by what or whom we don’t know. Was it a bear? Was it the hillbillies messing with them? Was it Bigfoot? The next scenes are in and around the tent at night. After an awkward marriage proposal from Bob we see the couple wakened from sleep by strange sounds in the woods. This is the part of a movie that provides the greatest challenge for a “Found Footage” film. Suspense and mood need to be established and maintained without using many cuts and/or edits in the film. It’s also necessary to make it believable that the characters would be filming what we’re seeing. I thought Bobcat did a fine job on all fronts during this stretch. The centerpiece is an approximately nineteen-minute shot of Jim and Kelly in the tent listening to the sounds around them and becoming increasingly creeped out as they try to figure out what they are hearing. The camera is on a tripod (or something that keeps it steady) and doesn’t move during this whole scene. At first Bob hears “knocking”, which is an actual method of knocking pieces of wood together that is supposedly used by Bigfoot creatures to communicate in some way. The sounds are coming from far off and aren’t frequent. It could certainly just be natural sounds of the forest–as Kelly tries to convince herself. Later they start hearing strange whooping sounds that Jim refers to as “vocalization”, another noted Bigfoot communication method. The yelps don’t sound particularly threatening, but are unnerving. And the noises seem to be moving around the campsite and getting closer. Next come deeper moaning sounds that are much more creepy, and what sounds like a child or a woman crying. They start to hear something walking around the campsite, rocks are thrown at the tent, and finally something or someone pushes down on the tent before retreating when Kelly screams. Throughout this long scene Kelly is transformed from a skeptic into a true believer (even if she’s most likely not sure exactly what it is that she now believes in). This whole scene is the centerpiece, and the most effective part, of the whole movie. We next see the couple at dawn as they break camp and announce that they are abandoning the project, heading out of the woods and going home. But first they have to find their way back to their car. Along the way Jim finds and collects a hair sample and they get the feeling (with increasing certainty) they are being followed. Naturally they don’t find their way back to the car. As nightfall nears they realize they had been spending hours walking in circles. The film closes out with the couple’s ultimate journey into fear as they finally encounter what has been following them and messing with them since they entered the deep forest. Without giving away the ending I will say that we find out in a few quick and loud minutes just why the story is being told solely through some “found footage”. I thought “Willow Creek” was an excellent movie. At least excellent in terms of a Bigfoot film anyway. I grew up in the 1970s and saw movies like “Creature from Black Lake” (1976), “Sasquatch: The Legend of Bigfoot” (1977) and the documentary “The Mysterious Monsters” (1975). To this day these remain my favorite Bigfoot films of all time. They probably wouldn’t be considered of very high quality today, but because of what they meant to me as a terrified kid they remain the best of the best. “Harry and the Hendersons” (1987) was a fine bigger-budget Hollywood film, and probably the “best” Bigfoot movie ever made, quality-wise, but I don’t really think of it a true Bigfoot film so much as a nice family movie that just happens to be about Bigfoot. I have also seen most of the slew of newer Bigfoot horror movies I mentioned at the beginning of this piece, and pretty much dislike the vast majority of them. I think “Willow Creek” is (to me at least) one of the best Bigfoot movies ever made, and probably the best since the heyday of the 1970s. It gave me genuine chills during the inside-the-tent scenes, and I can honestly say that, for me, it was genuinely scary in places (something that most modern horror films can’t say). To be honest, I was a bit disappointed with the ending. It had to have an ending, and this one certainly finished things up in a major (but still mysterious) way and let you know just what or who was responsible for the action outside the tent the night before. It even included a big surprise element that was foreshadowed earlier in the movie. It gets you thinking and wondering, but in the end it was just a touch too much for me. In fact, it felt almost like a shot-for-shot re-creation of the ending of “The Blair Witch Project”, with Bigfoot inserted in place of a witch. I can’t say exactly what was wrong with it, or how I’d recommend improving it, but it just felt a bit forced. Otherwise (and even with this issue) I really did think that it was a very good movie. It’s certainly something that Bigfoot buffs should enjoy. What might be the best thing about “Willow Creek” is the fact that it’s pretty obvious that there is indeed a Bigfoot creature (many of them in fact), but we never see it onscreen. The worst part of most of the new wave of Bigfoot horror films is the onscreen appearances of the Bigfoot creatures themselves. Whether it’s a guy in a suit or a CGI creature (and especially when it’s a CGI creature) the monsters always seem to disappoint big time. Some of the filmmakers seem to put a decent amount of effort into the costumes, but the low-budget nature of the direct-to-video market limits what they can do. The easy alternative is to go the increasingly accessible CGI route. These monsters always end up being overblown and movie too quickly and unrealistically to be believed. Bobcat saved the money of creating a creature and left that part to the imagination of the viewer. We all have a pretty good idea of what Bigfoot is supposed to look like and using our imaginations ends up being a much cheaper and more effective special effect. Bobcat did a great job of building the suspense, and by the time it all ends you don’t really feel you need to actually see the thing that’s doing all this stuff to feel satisfied. As I mentioned, the ending was very derivative of “The Blair Witch Project”. The whole movie was of a similar framework, but that’s to be expected in a “Found Footage” movie. I wasn’t bothered by the similarity until the end. The surprise element, mentioned above, concerns what can only be described as a “forest bride”, who was alluded to earlier in the film while the couple were touring Bigfoot Country. It’s adds a disturbing element to what was already a disturbing ending as our main characters meet their horrifying demise. Since this is a horror movie there’s nothing wrong with it having a gruesome and disturbing ending (and the gore, like the creature, is never explicitly shown). I’m not even sure exactly why I was put off by the ending. Maybe Bobcat just did too good of a job making me like these people and I simply didn’t want it to end the way I knew it had to end. This entry was posted on Sunday, May 5th, 2013 at 9:00 am and is filed under Bigfoot, Bigfoot Report, Cinema News, Cryptid Cinema, CryptoConsumerism, Cryptofiction, Cryptozoology, Guest Blog, Movie Monsters, Pop Culture, Reviews, Sasquatch, Videos. You can follow responses via our RSS 2.0 feed. You can skip to the end and leave a response. Pinging is not allowed. Looking forward to checking this one out! Also, did not read past the spoiler warning so please, if anyone else comments here, be kind and leave the surprised intact for the rest of us.